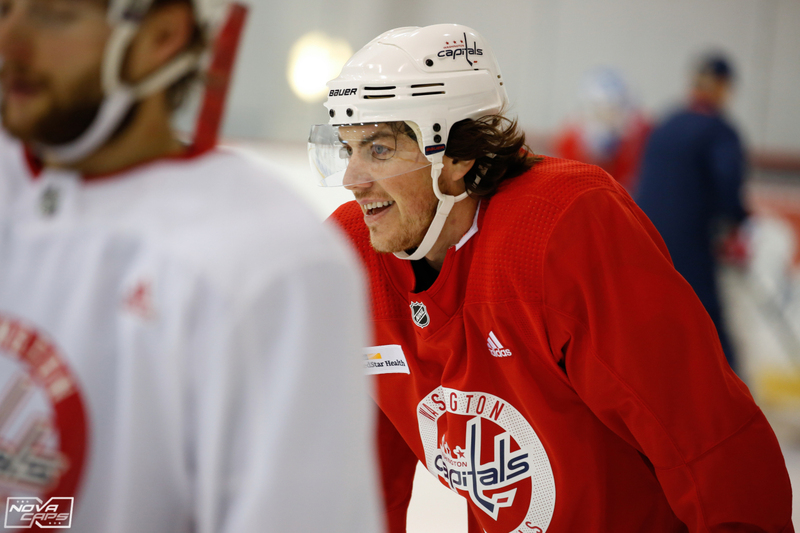 When T.J. Oshie was traded to the Capitals in July 2015, the former Olympic hero’s offensive skill-set was a welcome addition to a Capitals team that had lacked a productive, top-six right wing for a number of seasons. And while his offensive production is rightfully lauded, the 31-year old forward brings a number of other tangibles to the rink that tend to fly under the radar. Most hockey fans recognize Oshie’s talent. He has netted 20 or more goals the past three seasons, and has averaged 65 points a year (including playoff games). What most don’t realize, however, is the morale and grit that he brings to the ice each and every night, two important factors that positively affect everyone around him. May 3, 2018, is a prime example of this. A crucial Game 4 in the second round of the Stanley Cup Playoffs against the rival Pittsburgh Penguins. After going down 3-1 following an empty-net goal, an emotional Oshie let Pittsburgh blueliner Kris Letang know exactly how he felt as they fought well after the end of the game. Moments like this are great for a team’s morale following a loss. If you can’t win a game, at least leave a message that will stick with the opposing team. It’s old school, momentum-inducing hockey. Oshie stood up for his teammates and let Letang and the rest of the Penguins know that the Caps would not go down easily. The Caps would go on to win the next two games, advance in the playoffs and well..the rest, as they say, is history. Oshie, while not a fighter, has used his toughness and tenacity multiple times when needed to help his team, one of the many assets that he brings to the Capitals. Consider Game 5 against the Flyers in the first round of the 2016 Stanley Cup Playoffs. Then-Flyers forward Brayden Schenn was widely criticized for his cheap cross-check to Evgeny Kuznetsov’s knees after play had ended late in Game 4. Oshie wasted no time in going after Schenn at the start of Game 5. Oshie has faced adversity throughout his career. He has overcome his fair share of injuries, most commonly, concussions. None of this stopped him from playing to his full potential and training day in and day out. Fans have watched Oshie fight through tough stretches of scoreless streaks, injury problems, and low confidence to provide exactly what the team needs to secure a win. That alone shows just what kind of player he is. He puts his team before himself, and that’s the difference between a good and great athlete. In 2017, Isabelle Khurshudyan of The Washington Post spoke to how Oshie’s’ contract was earned in the locker room. Quotes from Oshie’s teammates, family and friends showed what a positive influence he was and continued to be for this Washington Capitals team. To many stats are important, but not the only thing that makes a player “great”. Oshie is the perfect example of what happens when a player combines skill with a positive attitude in the locker room and a stellar work ethic. Hopefully the rest of the hockey community can see what a superstar Oshie is. The Capitals are truly lucky to have him for the foreseeable future. This entry was posted in News, NHL, Players, Washington Capitals and tagged NHL, Nicole Giordano, T.J. Oshie, Washington Capitals. Bookmark the permalink. Agreed. And his leadership qualities are outstanding. Oshie never takes a shift off. He is a bulldog and leads by example. Immediately after the trade that brought him to the Caps the fans knew he was a keeper.